NTT Inc. - How Does a Conveyor System Work? How Does a Conveyor System Work? Over the years, manufacturing and industrial processes have developed in leaps and bounds. 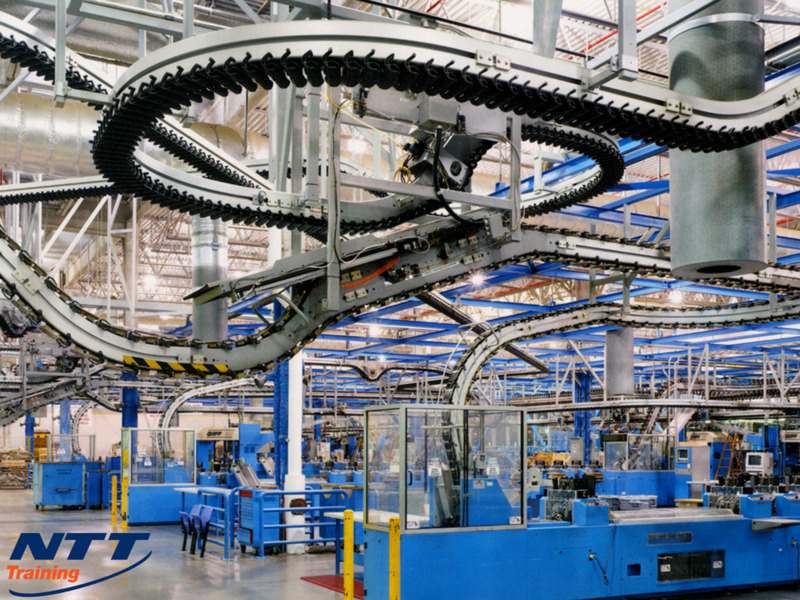 Today, manufacturing is characterized by mass production, great efficiency, and the use of high-speed machines. With the need to handle and move large, heavy industrial and agricultural material, it was necessary to integrate mechanical devices, such as a conveyor system, that would move the items with minimal effort. Conveyor systems play an important role in facilitating manufacturing and distribution processes. However, it is important to ensure that the systems work efficiently and do not undermine the various processes. This means training employees on how to prevent and troubleshoot problems and to correct them. Regardless of whether a conveyor system is motor powered or manual, it will consist of pulleys, idlers, rollers, wheels and belts. A frame supports the belt carrying objects from one location to another. In order to move the belt and transport the material it carries, the head pulley is usually the drive pulley. This makes a device that can be used to handle, move, and transport bulk materials, large volumes of resources, items being manufactured, and agricultural materials. With the proposed use of the systems, the conveyor belts are usually made of PVC or rubber. The belts are mostly made of several plies in order to provide shape and linear strength. One of the reasons why conveyor systems are commonly used is because they are an enhancement over human labor. There are several benefits of using these systems in industrial processes. The systems are designed with the inclination to save time when moving items from one level of elevation to another. Conveyor systems can be used to load and unload large volumes over a long period of time, a factor that presents unlimited opportunities. With automation, conveyors will have no limitation of height and will save time that would have been spent monitoring unloads. The systems are not only able to move in both directions but also control the speed of moving materials to prevent breakages. Several problems can occur in conveyor systems as materials are moved from one point to another. Mistracking – Mistracking refers to a situation where the belt drifts to one side, leading to uneven belt wear, product damage, unexpected downtime and troubleshooting issues. Seized rollers – The metallic components of the system can seize up, resulting in sharp edges. This will not only cause the belt to mistrack but will also poses a safety risk and can cause damage to the materials being moved. Belt spillage – Too little or too much tension when operating the systems can result in excessive stretching and conveyance spillage. Blockages – A blockage of any kind will compromise operations and result in hours of lost production. Conveyor systems training and seminars will help professionals understand not only the individual components but also the system as a whole. Those who attend the training sessions will also learn how to troubleshoot problems and carry out regular maintenance of the system. With proper knowledge about the components, the problems that are likely to occur and how to handle any defects, workers will be able to fix the problems as required. Relevant knowledge and experience will also help to minimize or eliminate the risks of accidents and injury during maintenance and repairs. If you would like to learn more about conveyor systems training and seminars, please reach out to NTT Inc. today. We will provide you with more information and guide you on how to enroll your employees for the training programs.